This graphic illustrates where Mars mineral-mapping from orbit has detected minerals that can indicate where a volcano erupted beneath an ice sheet. The site is far from any ice sheet on modern Mars, in an area where unusual shapes have been interpreted as a possible result of volcanism under ice. Volcanoes erupted beneath an ice sheet on Mars billions of years ago, far from any ice sheet on the Red Planet today, new evidence from NASA's Mars Reconnaissance Orbiter suggests. 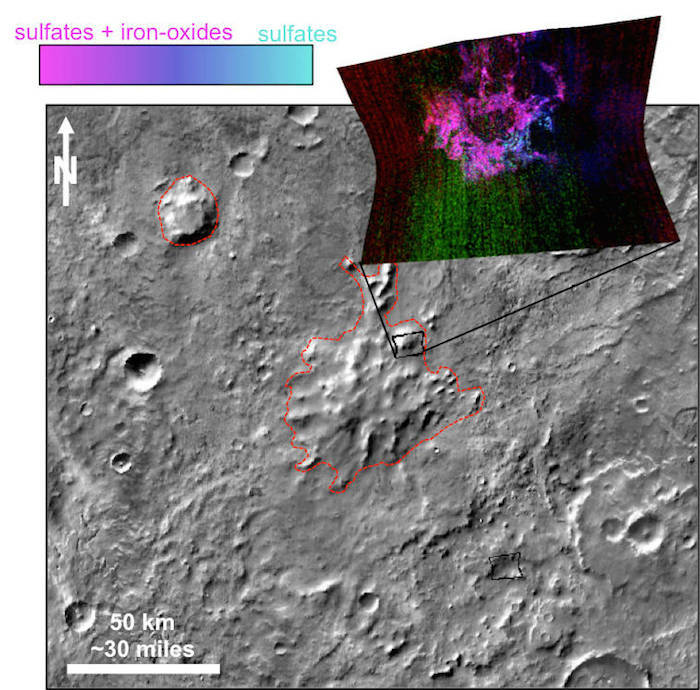 Sheridan Ackiss of Purdue University, West Lafayette, Indiana, and collaborators used the orbiter's mineral-mapping spectrometer to investigate surface composition in an oddly textured region of southern Mars called "Sisyphi Montes." The region is studded with flat-topped mountains. Other researchers previously noted these domes' similarity in shape to volcanoes on Earth that erupted underneath ice. "Rocks tell stories. Studying the rocks can show how the volcano formed or how it was changed over time," Ackiss said. "I wanted to learn what story the rocks on these volcanoes were telling." Characteristic minerals resulting from such subglacial volcanism on Earth include zeolites, sulfates and clays. Those are just what the new research has detected at some flat-topped mountains in the Sisyphi Montes region examined with the spacecraft's Compact Reconnaissance Imaging Spectrometer for Mars (CRISM), providing resolution of about 60 feet (18 meters) per pixel. "We wouldn't have been able to do this without the high resolution of CRISM," Ackiss said. The Mars Reconnaissance Orbiter Project has been using CRISM and five other instruments on the spacecraft to investigate Mars since 2006. The project is managed by NASA's Jet Propulsion Laboratory, Pasadena, California, for the agency's Science Mission Directorate, Washington. The Johns Hopkins University Applied Physics Laboratory in Laurel, Maryland, provided and operates CRISM. Lockheed Martin Space Systems in Denver built the orbiter and supports its operations.